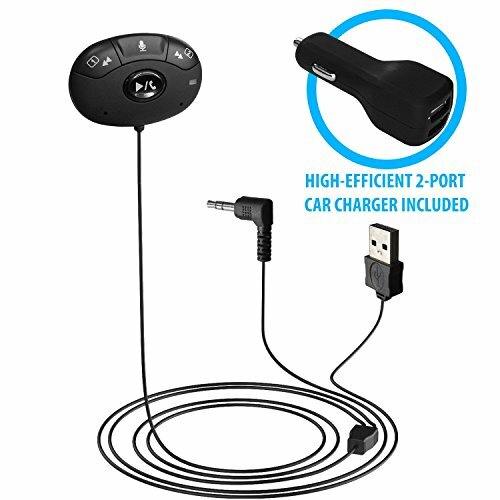 Bluetooth Receiver for Car, HomeSpot Audio Music Streaming Adapter, Wireless Phone Call Car Kit with Built-in Mic, Echo and Noise Reduction, 3.5 mm Stereo Output and Hands Free Calling for vehicle. HomeSpot CarKit enables the use of cell phones and smartphones under hands-free operation through Bluetooth wireless technology. Connection with HomeSpot Car Kit allows you to answer and receive phone calls without touching your phone. It also provides two quick dial buttons for calling two favourite contacts pre-defined in your iPhone (or Android that supports PBAP profile) phonebook, and one dedicated button for siri activation (or Google Now if the Android device supports it). STAY CONNECTED ON THE ROAD - Stream GPS directions, music, and podcasts wirelessly from your Bluetooth-capable smartphone, iPod Touch, iPhone, iPad or Android devices. SEAMLESSLY SWITCH BETWEEN CALLS AND MUSIC - easy control of music and calls, with one tap you can take a call and once the call ends you can go back to enjoying your music with easy controls for skipping tracks. INSTANT AUTO-RECONNECT - Enhanced micro-chip detect your last two connected devices and automatically reconnect to it. Just start your engine and the car kit is ready to use. UNIQUE SPEED DIAL ENTRY - Speed dial to 2 favorite numbers in only a few seconds with just the push of a dedicated button. SIRI / VOICE ASSISTANT ACTIVATION - Siri activation button providing responsive interaction with Siri; Supports Siri Eyes Free mode.